Filters:Astronomik Deep-Sky G 1.25", Astronomik Deep-Sky R 1.25", Astronomik Deep-Sky B 1.25", Astronomik OIII 6nm CCD 1.25", Astronomik H-alpha 6nm CCD 1.25", Astronomik L-3 UV-IR Block 1.25"
About 3000 light years from us, in the constellation Draco, lies the Cat's Eye Nebula. 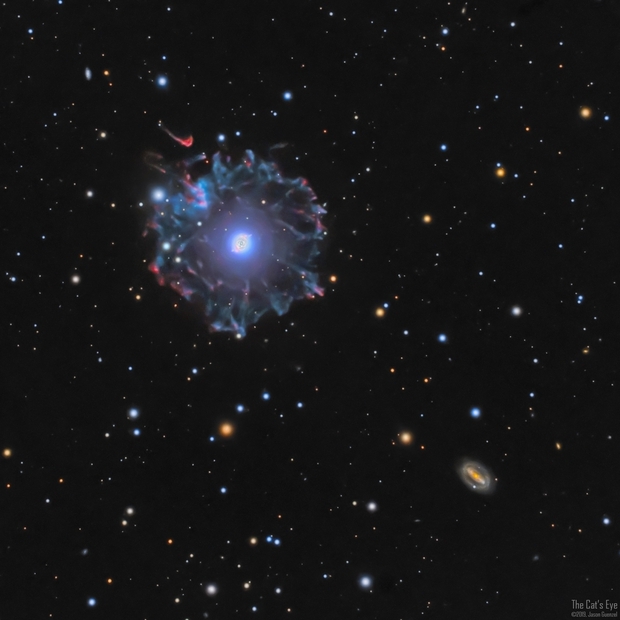 This planetary nebula consists of several layers and structures. The innermost core contains several bubbles that were created at various parts of the planetary nebula stage. These consist of hydrogen, primarily, and are currently being shaped by the intense stellar wind. The visible central star is known as an "asymptotic giant branch" star with a type of Wolf-Rayet spectra. This means it a hydrogen-depleted star with a bare carbon-oxygen core. In fact, the entire planetary nebula was formed through the evolution of this star from its red giant phase to its current state. The original main sequence star likely wasn't too different from our own sun. During the red giant stage, shells of hydrogen and oxygen were shed during pulsations of the upper atmosphere. Outside the core these can be seen as regular concentric rings, while further out it gives rise to the spider web tangle of the outer nebula. Yes ... this image was a long time in the making and processing! But, I'm happy with the result here. The image could be written as HaOIIILRGB and is a collection of 6 channels of data. The data was balanced to give a roughly natural color palette and given an HDR treatment to make the core visible and not completely saturated. The core is very bright compared to everything else in the field. 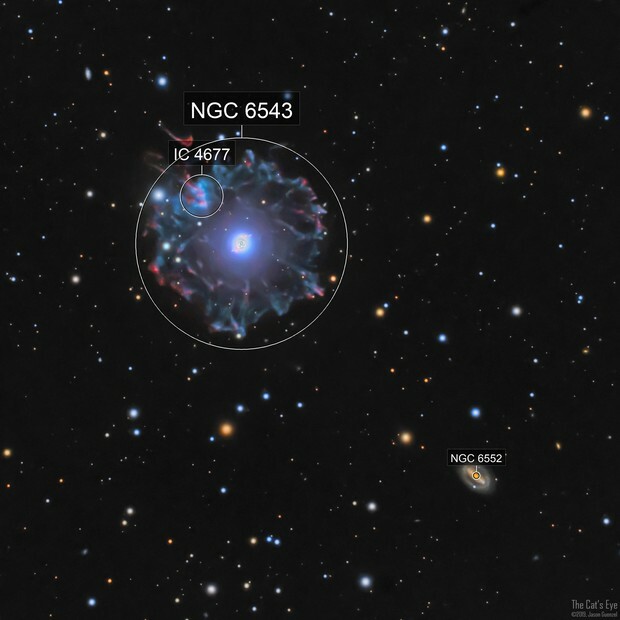 I also chose to frame NGC 6552, which is an interesting little galaxy about 350 million light years distant.